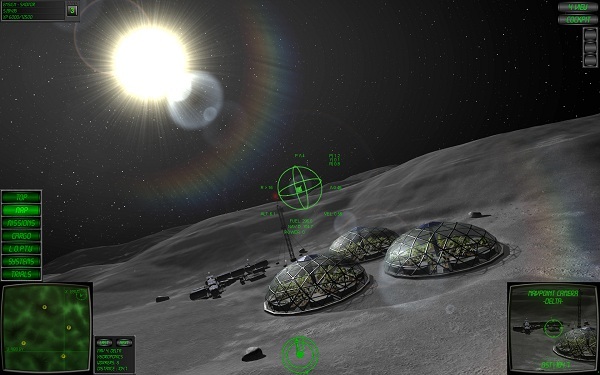 Lunar Flight PC Preview. Failure is not an option people; Lunar Flight is a beautiful look game that handles like a dream. It’s an at times relaxing game that borders on a simulator. It covers an area of gaming and simulation that has been, for the most part overlooked in favor of shooters and bomb and missile fire….Space flight with some grounding in flight dynamics and physics of space. When this came across my desk to look at as a download from GamersGate, I almost past it by and was prepared to just do a little blurb about it. 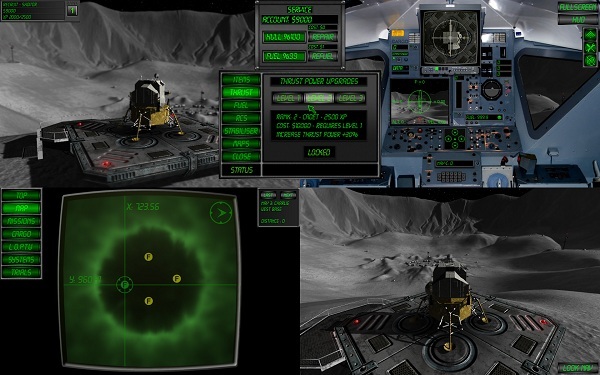 The look and premise drew me in to take a closer look and as an avid flight sim gamer, I was pleasantly surprised at the quality, look and feel of Lunar Flight. Rather odd that STEAM is missing the boat on this one. As we write these reviews we check to see what places the product can be downloaded from…it seems STEAM is sorely remiss here. Good catch GamersGate! 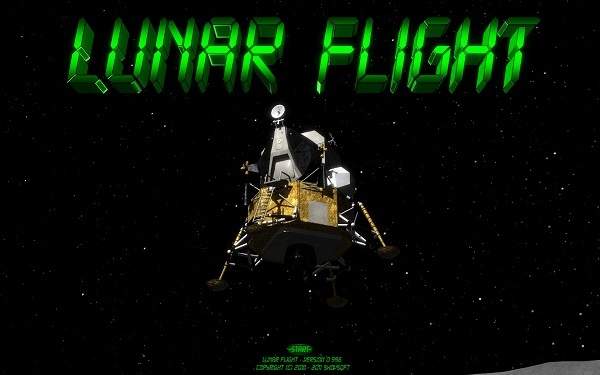 Lunar Flight is an incredibly atmospheric game from indie game company Shovsoft. While there is not huge explosions and nail bighting over the top action, the game more than makes up for it with its attention to detail and very cool graphics. It borders just enough on a simulator, but not so much that you have to learn a gazillion buttons to play. 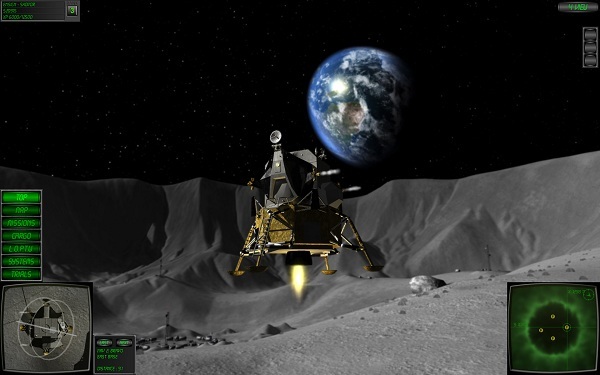 Controls are simple and to the point, and just like flying the real NASA LEM (Lunar Module), players have to acquire a good sense of finesse and fine tune their use of the controls to get the craft where it needs to go without running out of fuel and also without crashing in a heap. Controlling the main engine burn for ascending or descending is straight forward, and the designers even made sure to get designs right for the four Reactor Control thruster assemblies to control different direction thrusts and turning of the craft when used in different combinations. Using any thrust uses fuel, so it’s a constant dance of finesse to get the craft where you need it and still have enough fuel, running out of fuel is very bad, as in crashing bad. 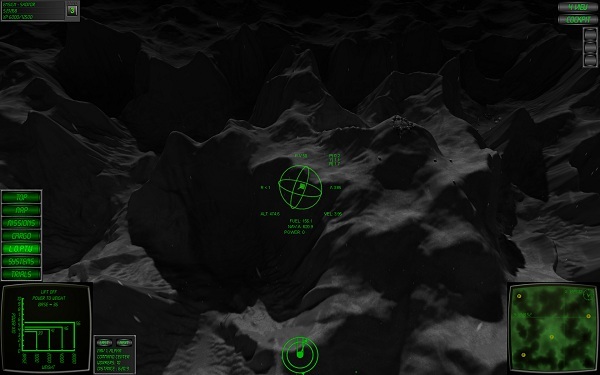 Missions range from cargo transport, data gathering and locating lost cargo, all taking place over the moon’s surface with various moon base landing pads. Successful completion of missions earns the player money as well as pilot points. Money earned can in turn be used for upgrading the craft. Other than the missions there are also trial challenges and online leaderboards. There are different screens to aid the players in missions, of course there is the cockpit, of which my inner love for space craft came out and did jumps for joy. 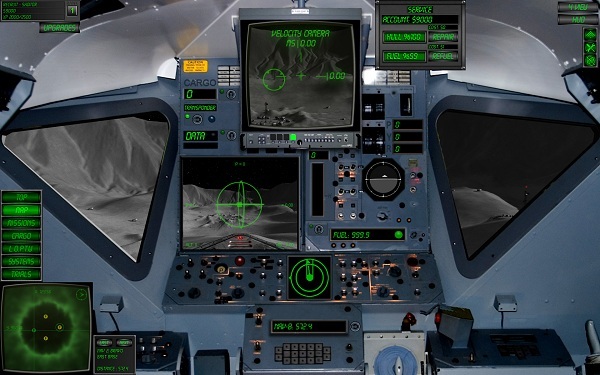 Lunar Flight has a cockpit that looks very much like the NASA LEM. Right down to the control panels and view ports. Graphically the game is pretty basic, but that is the beauty of it, the graphics are spectacular to behold. In space history, the LM (LEM) became the most reliable component of the Apollo/Saturn program. It was the only piece of equipment to never have any significant failure that impacted a mission. This craft was the vehicle that was used impromptu as a lifeboat for the Apollo 13 Astronauts when explosions did heavy damage to the Apollo Service Module. So it is a thrill to have this space craft as the primary focus in a space flight game. It’s a nod to all the heroes from whatever country they are from, those few that braved the stars. Lunar Flight may not appeal to everyone. Those that dream of flight or have a passion for space exploration owe themselves a look at this game. Failure is not an option people; Lunar Flight is a beautiful looking game that handles like a dream.